Subjects and Themes(Dreaming): Uwalki Watiya Tjuta. 'Minyma Tjukurrpa Project' and consequently became one of the principal women painters at Kintore. Her brother is the late chairman of Papunya Tula Artists, Turkey Tolson, who is also renowned for his artworks which are sought by investors all over the world. Mitjili was married to artist Long Tom Tjapanangka. Long Tom won the prestigious 1999 Telstra Art Award and also gave her the motif of the Irantji ranges she incorporates in her latter paintings. Mitjili's sister is Wintjiya Napaltjarri and wife to Turkey Tolsen's father, Tupa. She first began painting in 1993 for the Ikuntji Women's Centre. Mitjili paints the female side to her father's Dreaming, which is the story of the spear straightening ceremony as taught to her by her mother. Mitjili also paints the topography of her father's country Uwalki, with its pristine sand hills, shrubs and Watiya which are the trees that traditionally provide wood for spears. 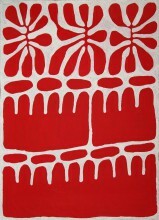 The most prominent theme in Mitjili's painting concerns the watiya tjuta (Acacia trees) which relate to men's business and her recurring tree motif is based on patterns her mother used to draw in the sand. In her paintings the tree emerges from beneath a veil of diluted paint, applied using the dot-dot technique, giving the impression of solid colour. Other Dreamings Mitjili has inherited include Wangunu or Portulaca (small black seeds ground and used to make damper), as well as Arkatjirri a fruit similar to a sultana that is found in the bush. A large body of her work includes vibrant reds, yellows and browns, which serve to communicate the essence of flowers, many of her works being primarily concerned with their representation. Her superb sense for spacing, patterning and colour is distinctively appealing and indicative of her playful manner. Since she began working with the Ikunti artists she has developed her own strong and distinctive personal style that has gained her acclaim within Australia and internationally. Mitjili's exhibitions regularly sell out. Her work was included in the exhibition Spirit Country: Contemporary Australian Aboriginal Art at the Fine Arts Museum of San Francisco 1999 and featured in the Adelaide Biennial 2000, Beyond the Pale. Her work is held in major public and private collections in Australia and overseas. • 1999 Fine Arts Museums of San Francisco, U.S.A.